Home › Other › What is the Best Golf Umbrella? Rain forecast for the weekend? But, you had this round planned out months ago! Damn that weatherman! You are going to play this weekend, and some mere raindrops aren’t going to stop you! If this is you, then you better have the best golf umbrella ready for your battle against the elements. You won’t find a better deal than this: THREE full sized 60-inch golf umbrellas for a mere twenty bucks! These Woodworm umbrellas won’t win any design awards, but they are solidly made, and have a double canopy feature to prevent the umbrella from inverting in high winds. You can split the three umbrellas with your golfing buddies, or keep one in your car, and one in your office just in case. If you are on a budget, you won’t find a better deal than this. Think bigger is better? This 68″ RainStoppers Oversized Golf Umbrella is so big that it can cover three or more people. Besides being absolutely huge, it is also extremely strong, and durable even in high winds. If you need an umbrella that can cover yourself, your wife, your kid, and your dog, then this is the one for you. Also, for under $20, you won’t find a better priced oversized umbrella. Want to stand out from the crowd? Even if you’re the only one crazy enough to play in the rain? Then the Haas-Jordan Pro-Line is for you. It comes in a crazy amount of unique colorways, and will help set apart from those boring black and blue umbrellas everybody has. 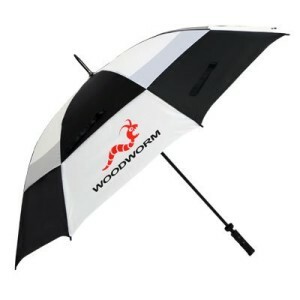 It is also a solidly made umbrella with a slip resistant grip handle. Forget size, forget price… just want the best damn golf umbrella available?? Then you want what the professionals use: the aptly named GustBuster Automatic Golf Umbrella. It’s lighter, stronger, faster and just plain better than any umbrella out there. The GustBuster simply puts all other golf umbrellas to shame. It features a “pinchless” open and close release system, has a double-reinforced (thats re-reinforced), LIGHTNING RESISTANT, fiberglass shaft that offers unparalleled strength and durability. It was tested by the Vaughn College of Aeronautics to withstand winds of over 55 miles per hour. If you’re playing in winds stronger than that, then there might be something wrong with you. Still don’t believe that this is the best golf umbrella in the world? GustBuster includes a lifetime warranty to backup their product. 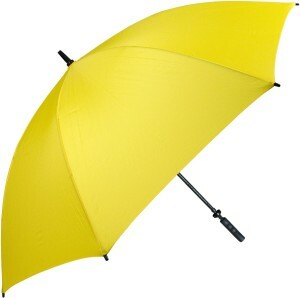 Start singin’ in the rain, and buy the GustBuster Classic 48″ Automatic Golf Umbrella. Give the people what they want! 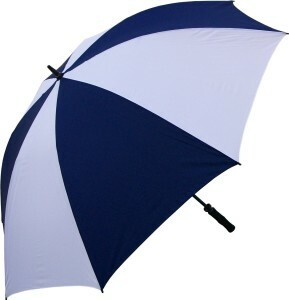 The Procella umbrella does just that, and is no wonder why it is the number one rated golf umbrella on Amazon. This monster 62″ umbrella has every feature you would ever want in an umbrella — double canopy mesh venting system that is able to resist strong winds, one hand opening system, ergonmic slip-resistant handle, and a rust-proof and lightning resistant shaft. 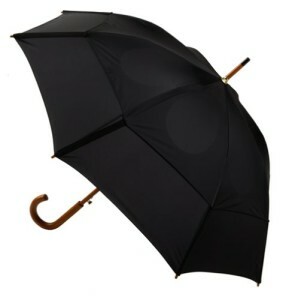 The umbrella is constructed of carbon fiber, and weighs a measly 1.1 pounds (approximately 0.5 kg). One downside of this umbrealla, is that it is a bit more expensive than your average umbrella. But, the company does offer a 100% money back guarantee. If you are unhappy with the umbrella, or receive a faulty one by chance, they will simply give you a full refund or send you a new umbrella! 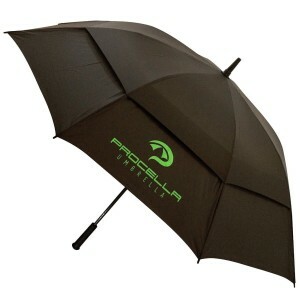 The Procella Golf Umbrella also comes in six different colorways, along with matching carrying sleeve. Just for the hell of it, they even throw in some free golf instruction videos if you buy the umbrella. Join 400+ other happy customers, buy the top customer-rated golf umbrella. What’s the Best Golf GPS Device? 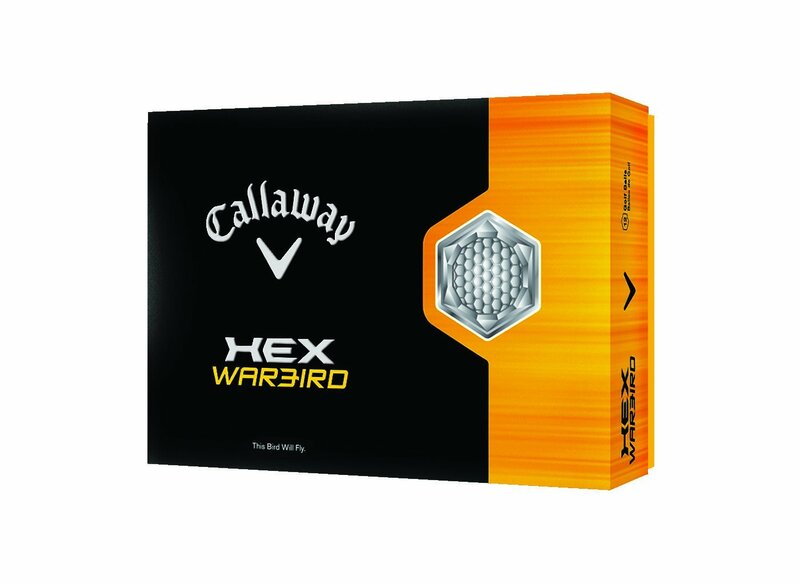 Choosing the Best Golf GPS Watch The Best Distance Golf Ball for Average Golfers What’s the Best Golf Cart Bag?